For Whovians Only: Awesome 10th Doctor Costume Tee | OhGizmo! By Hazel Chua on 11/16/12 • Leave a comment! Some people say they can’t forget their first time–or their First Doctor. But if you ask me, the Tenth Doctor was the greatest Doctor Who incarnation there ever was (no offense to the Eleventh Doctor.) While they are essentially the same being, we get a ‘new’ Doctor with a new appearance and different quirks every time he has to regenerate. 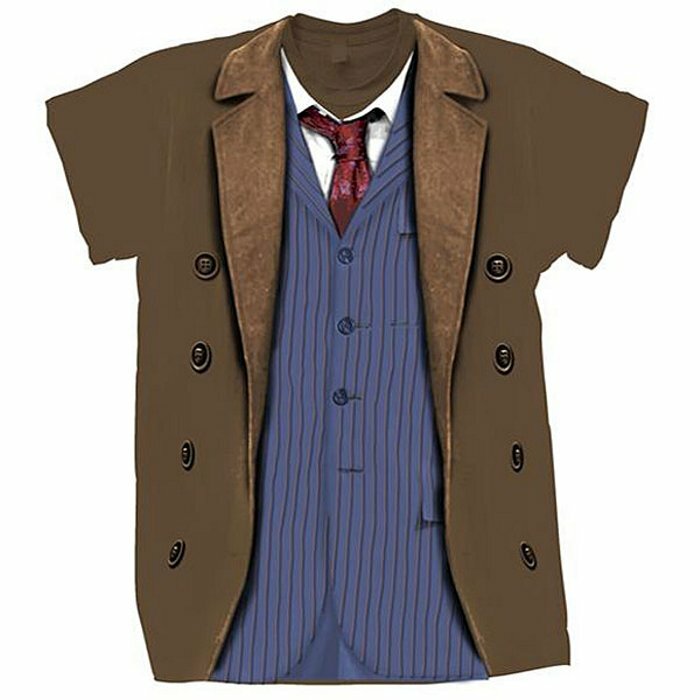 If you’re like me and agree that David Tennant was the ultimate Doctor Who to ever play the titular role in the series, then you might want to add this 10th Doctor Costume Tee to your Whovianistic collection of Doctor Who paraphernalia and collectibles. It’s available for $19.99 – $21.99 on ThinkGeek.